The Rambus PCI Express (PCIe) 4.0 SerDes PHY is designed to maximize interface speed in the difficult system environments found in high-performance computing. It is a low-power, area-optimized, silicon-proven IP designed with a system-oriented approach to maximize flexibility and ease integration for our customers. 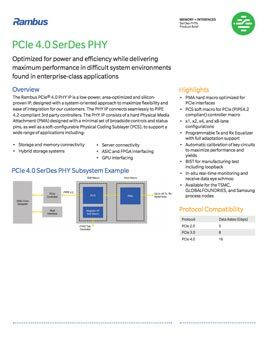 The PCIe 4 SerDes PHY supports PCIe 4.0, 3.0, and 2.0 and has full support for manufacturability.